In 2015, the Paramount Theatre celebrated its one hundredth year of operation. During this time, our stage has been graced by Presidents, rock stars, comedians, scientists, and countless other notable figures. We’ve premiered films, played host to a diverse array of festivals, and kept Austin’s most historic venue looking pristine. In 1976, the Paramount secured its place in history when it was added to the National Register of Historic Places. The past 100 years have been nothing short of incredible, and we remain dedicated to our mission: “…to engage ALL central Texans through extraordinary live performances and films.” We couldn’t do any of this without the generous support of The Century Club. The Century Club is a society of passionate major donors formed to preserve and maintain the Paramount Theatre for centuries to come. Today, there are less than a dozen theatres like the Paramount. With its extraordinary architecture and backstage rigging system that still operates the way it did in 1915, the Paramount is truly in a league of its own. 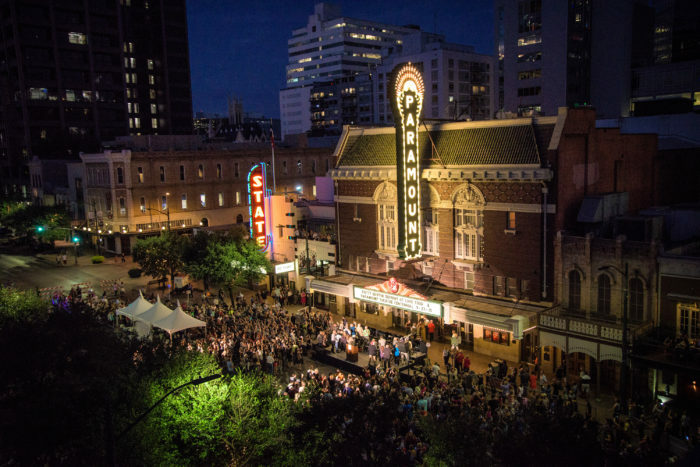 Support from our Century Club members helps to ensure that the Theatre remains a destination for over 200,000 Austinites each year, including thousands of school children experiencing their first theatrical event. Additionally, the Century Club helps fund programs that provide creative opportunities in several Austin area public schools, many of which receive Title I funding. Priority access to the best seats in the house including opera boxes – no exceptions! See your name in lights on the Paramount marquee! Click here to see a complete list of benefits. Century Club is a $10,000+ annual membership. We welcome the opportunity to visit with you if you have any questions or if you would like a private tour of the theatre. Please contact Lauren at centuryclub@austintheatre.org or by phone at (512) 692-0530 to coordinate. To join today online click here. To download a pledge form, click here and mail to Paramount Theatre Century Club, PO Box 1566, Austin, TX 78767.